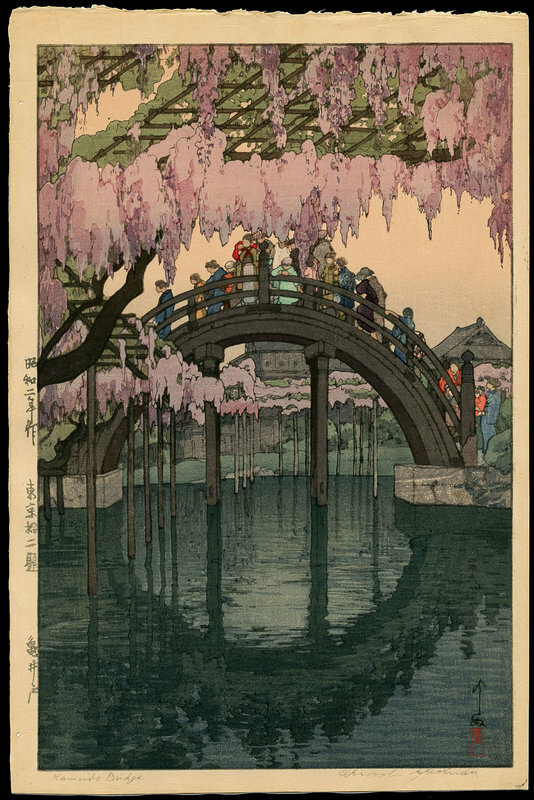 Yoshida, Hiroshi (1876-1950) "Kameido Bridge" - Woodblock - Chinese and Japanese woodblock prints for sale, silkscreen, scrolls, watercolor, lithographs. 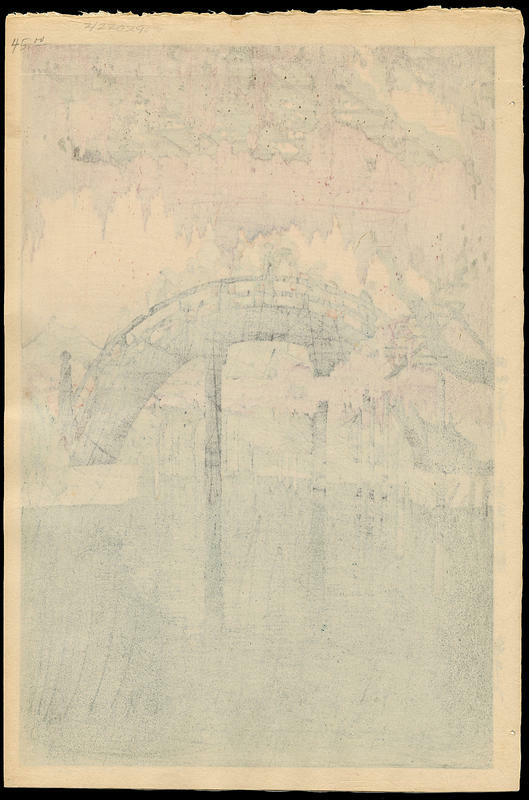 Artwork Details for Yoshida, Hiroshi (1876-1950) "Kameido Bridge"
Condition: Basically fine. The colours are vivid and there are only a few light surface marks. It is lightly age-toned so likely a print from the 1950's. There are two paper drying holes in the left margin, a light horizontal crease from the top right margin, and there is some minor waviness in the top margin along with a printer's crease. On the verso, "45.00" is written in pencil. Notes: The drum bridge at Kameido with ancient Wisteria in full bloom. Widely considered to be among Hiroshi Yoshida's masterpieces. This is an early posthumous edition (I suspect 1950's) using the same colour palette as the original life-time strikes (recent printings have a more vivid palette). Date and title in the left margin. Signed Yoshida, with artist's seal Hiroshi, in the image area. Vivid, pristine colours. Ten blocks and 88 separate impressions were used to create this beautiful design. This item will be drop-shipped from my colleague in Santa Fe, USA.